Well we are back on the road having picked up the Robbiebago (our caravan) in Perth and then we headed not far down to Cardup for a week. 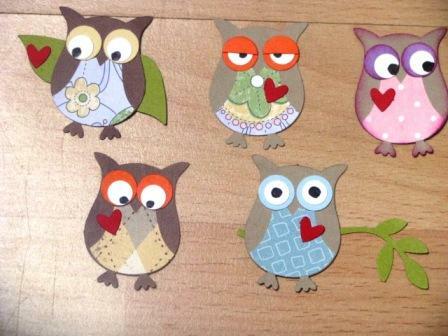 I was able to start on the Stampin Up 2 step owls that my friend Christie graciously sent me (see Christie's blog for more Stampin Up ideas and supplies). Then of course I need to make up a card with one of the owls. I tried to vary the expressions by the eyes. I have saved the others for a later date as I really had to get into making a new explosion box as a thank you for our host family. I experimented with a new flower and came up with my version of the Australian Strawflower. I also made a new 'something' flower (buds on a stem) but I can't remember what flower it resembles...can you name it? I really needed to knuckle down and make my first Explosion Box in 3 months as I needed one as a thank you gift for our hosts. They have a large family and lots of Australiana country crafts in their house, so I wanted one with a Australian theme. The photo album I thought would be ideal for their large family of 11 kids. I also made some additional flowers and other embellishments for them to add along with their photos. Below is the finished box. Click on the photo to get a larger photo if you want to see more detail. Thank you for looking. I would be nice to get some feed back from time to time, just to make sure people are looking at what I put up on this blog. If you want to know more about my trip around WA then just click on the Robbiebago link in the right column. See you next time! I LOVE your owls! Very cute! Can you make me a male card with an owl on it??? Thank you for visiting. Do leave a comment and come back again soon.